AleaSoft, January 31, 2019. 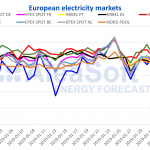 The Spanish and Portuguese MIBEL electricity market price was once again the lowest in Europe this January 31, and it is the third time this year. As analysed by AleaSoft, the high wind energy production is the main cause of this lower price. This January 31, the MIBEL electricity market of Spain and Portugal scored again the lowest daily mean price in Europe, with 54.88 €/MWh, even below the traditionally lower Nord Pool market of the Nordic countries, whose daily mean price on this occasion was 56.26 €/MWh. According to AleaSoft, the high wind energy production is the fundamental cause of this lower price. It is the third time this year that the Iberian market has the lowest daily mean price in Europe; previously it had occurred on January 23 and 24. In general, during this week that began on January 28, the price of most European markets has hovered between 55 €/MWh and 60 €/MWh, except for the Italian IPEX and the British N2EX markets, which have been between 65 €/MWh and 70 €/MWh. The January 2019 monthly mean price in the Spanish electricity market was 61.99 €/MWh, which represents an increase of 0.18 €/MWh compared to December 2018 and 12.01 €/MWh compared to January 2018. Portugal closed this month with 62.69 €/MWh, placing itself 0.82 €/MWh above December 2018 and 11.06 €/MWh above January 2018. In this month of January, the German EPEX SPOT market has been the one with the lowest monthly mean price in Europe, with 49.39 €/MWh. The electricity futures of the main European markets have fallen this week. The French futures for February this year traded in the EEX market have fallen more than 8 €/MWh compared to last week. 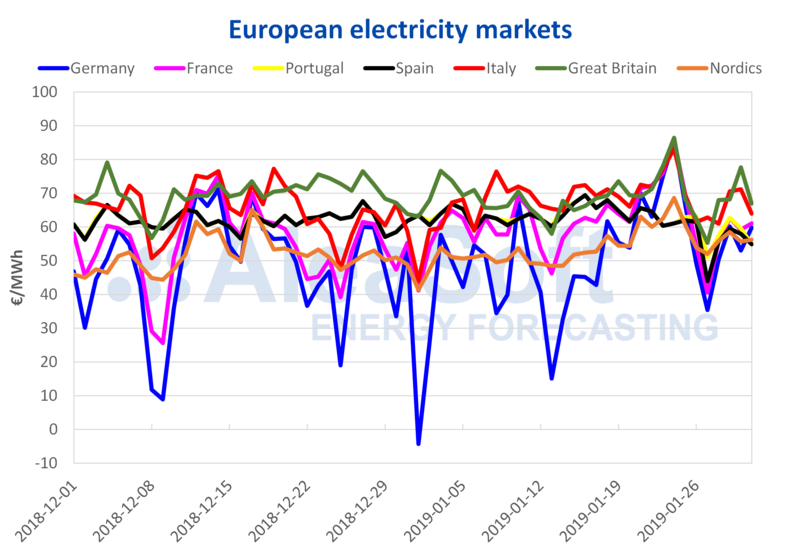 In the case of Germany, also in the EEX market, the decrease in the futures for February this year compared to last week was around 4 €/MWh, and for Spain and Portugal, in the OMIP market, it has been in a range between 1.5 €/MWh and 2.5 €/MWh. During this week the Brent oil price remained stationary around 60 $/bbl, although in recent days there have been increases because of the supply concerns due to the production cut in OPEC countries and the sanctions imposed to Venezuela by the United States government. In the session of Wednesday, January 30, futures for March 2019 settled at 61.65 $/bbl. The TTF gas futures for the month of February 2019 continue the downward trend they had been experiencing since last week, when they were close to 22 €/MWh, and in the session of January 30 they settled at 20.18 €/MWh. For next week it is expected that prices will remain around 20 €/MWh. The price of API 2 coal futures for February 2019 has been stationary since the end of last week, between 79 $/t and 80 $/t, settling on January 30 at 79.85 $/t. In AleaSoft, the price is expected to remain stationary next week. The CO2 emission rights price has remained around 23 €/MWh this week, lower than last week when it reached values above 25 €/MWh. It is expected that during this week that began on January 28, the electricity demand will be 0.9% lower than the previous week, due to milder temperatures. In the whole month of January, in AleaSoft it is estimated that the electricity demand of mainland Spain will grow around 3.4% with respect to January 2018. For the next week of February 4, it is expected that the electricity demand will increase around a 1.7%, because of slightly lower temperature forecasts. This week of January 28 has been characterised by a high wind energy production, which is estimated to be 26.5% higher than the previous week. According to calculations made by AleaSoft, in January 2019, wind energy production will be around 12.3% higher than in January last year. 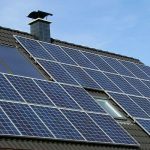 As AleaSoft has been able to analyse, still with estimated data for day 31, in January this year solar energy production, both photovoltaic and solar thermal, has increased compared to January 2018: around 12.6% and 59.2% respectively. It is expected that next week of February 4, the total solar energy production will increase around 62.6% compared to current week. Hydroelectric reserves, which had been declining since the beginning of 2019, have increased this week up to 9,898 GWh, which represents 42.5% of the total capacity.